One Billion. You may think I’m referring to the number of Facebook and LinkedIn users, but I’m not. I’m referring to the approximate population of India. While on a trip there, I decided to take pictures of local businesses, then compare the “real” with their Social Media presence. Sadly, I was unable to find more than a handful on the web, let alone on the Social web; the notable exception being a few of the global brands. Instead, I found a thriving entrepreneurial culture, where everyone – from the richest to the (almost) poorest – is connected in two ways: by cellphone, and in the real world. The majority of the billion (95% to be exact) are busy living, rather than voyeuristically watching others live via Facebook – they don’t even have internet access. The 5% have their favorite Social Networks, including Facebook, LinkedIn, Ibibo and Bharatstudent. But for those of us who spend significant time with our own Social Media favorites, 95% is an important reminder: most of the world is connected with real world relationships – not virtual ones. This week’s action plan: Is it possible that you have been neglecting the part of your network that isn’t regularly online? Or isn’t online in your chosen social network? This week, look through your electronic black book for those who are missing, and reach out to them in a way that is comfortable for them. PS: This is another example of how sprinkling more Social Media “juice” over an opportunity will not magically create more opportunity. Organizations need to crack the relationship nut, and Social Media is but one vector that can help. 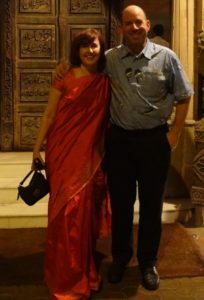 PPS: While in Mumbai, I recently spent some time with fellow professional speaker Lea Brovedani for dinner. While we did coordinate our plans using LinkedIn, we actually met in person at the restaurant. Real-world networking in action!